Last one of the season where we see if anyone can beat Simon. If he loses very badly and one of the challengers has a 13-0 win it’s possible he may not make it. As the light is fading fast we may only have time for one game (or 2 short ones) but there will be a nice cup of tea afterwards in the clubhouse and a chat about winter fixtures and next year. 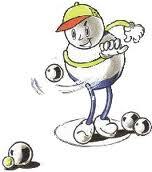 Thanks to all who played yesterday in the return fixture at Heckmondwike Petanque Club. It was good day and 7 teams from each club played 3 rounds which meant (er…) 22 games. The organiser kept all scores secret until the end but as the final game was being played it leaked out that the score was 11-10 to Heckmondwike. The last game was at that time 11-1 to Heckmondwike. Then for no obvious reason the Leeds team of Paul & Rosanna scored 4, 3 and 5 in three out of the next four ends ends to emerge 13-12 winners and the whole shebang ended 11-11. Add this to the 10-8 victory for Leeds earlier in the season and it’s clear that there’s not much in it. Just a reminder about our match versus Heckmondwike this Sunday (29th). We’ll be meeting at Glen Road at 10am. From there we’ll organise cars and hope to set off to Heckmondwike by 10:15. This should get us there for 10:45 to start playing at 11. Weather report looks OK for Sunday as well! See you all there. We aim to arrive at Heckmondwike for 10:30 to 10:45 for the games to start at 11am. If you are coming to the club this Sunday (22nd) we’ll be organising travel etc. If you would like to play but won’t be coming this Sunday can you let Paul know by phone or email so you can be included. The more people who can play the better so come along! Here’s hoping for some good weather and some good games. See you there! Tuesday 3rd September. Start 1845. 3 rounds if we can. Neill is in charge. Scores will be kept; small prize on the night for the winner. Scores go towards season long melee trophy. If you’re late you can join in round 2. Floodlighting if required.